Originating from Afghanistan the carrot was originally grown for its leaves and seeds rather than for its root. Back then carrots were either purple or yellow in colour. The orange carrot didn’t appear until the 17th century, in the Netherlands, where it was bred as a tribute to William of Orange (who later became William III of England) – an early example, one might say, of politics interfering with food. Nowadays, as you look along the seed racks at your local garden centre, it would be hard to believe that there had ever been anything other than orange carrots. All you will see is packet after packet of orange carrot seeds for sale. And most of them will be labelled “F1”, in other words they are hybrids, not a true variety at all. This is true of many other vegetable seed packets. F1 stands for “Fillial 1” and means the seeds are the result of a cross between distinctly different parent plants. The F1 varieties have been developed specifically to combine particular characteristics from the parent plants (in the case of the carrot the hybridisation may be, for example, to produce a carrot which is both resistance to carrot fly and also fast growing). The problem with F1 types are twofold. Firstly, beneficial characteristics achieved through hybridisation (such as being fast growing) may well benefit the mass producers, supplying the supermarkets, but are often at the expense of another important characteristic, taste. Secondly, if you collected the seed from an F1 carrot and then planted them the following year, you would not end up with the same plants as before – in fact you may not end up with anything at all, seeds from F1s are often sterile – if any plants do grow they will look more like a sorry mixture of the “grandparent” plants than the parent with the “desirable” characteristics. Saving seed from one year to plant the next is an age-old and vital tradition. Admittedly, with carrots it’s a lengthy process as the plant only produces seeds in its second year but the Heritage Seed Library have an excellent video explaining how to do it here. Saving seeds not only helps to preserve true varieties it also encourages the plants gradually to adapt to, and thrive in, the local conditions in which they are grown. 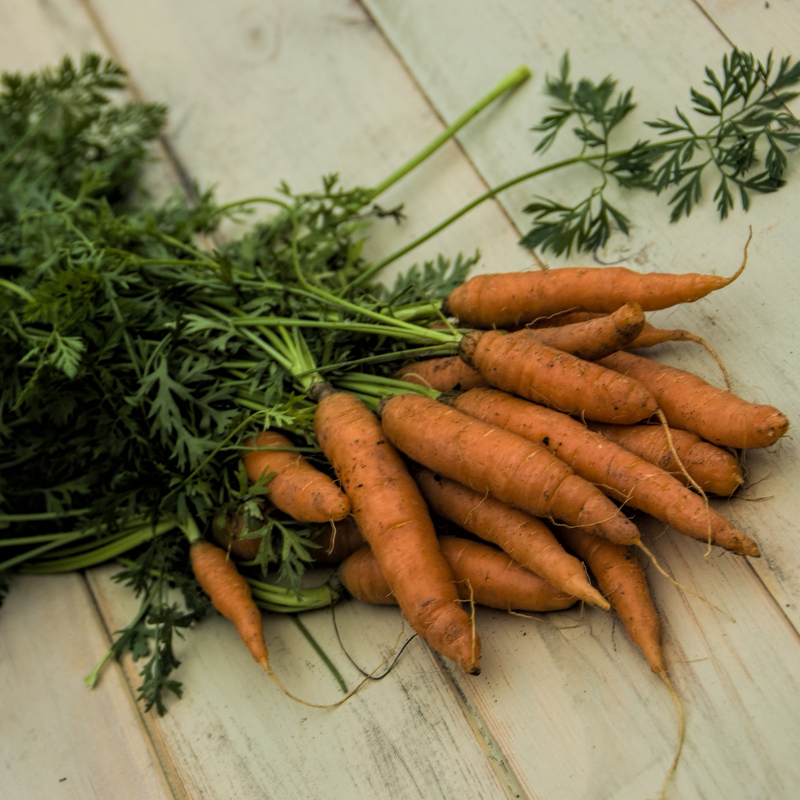 Thanks to organic gardeners, the Heritage Seed Library and some other smaller seed companies like Real Seeds it is still possible to obtain and grow the older heritage varieties of carrot, such as Afghan Purple, Jaune Obtuse du Doubs and Egmont Gold. And amongst the orange “interlopers” there are some excellent non hybridised varieties, such as Chantenay, which is a variety I grow on my allotment, the Circus Garden. Time to head for the kitchen, where I want to share my recipe for carrot, cashew and coriander fritters, which are not only alliterative but also quick and easy to make and rather tasty. I find these fritters combine particularly well with feta cheese, the saltiness of the feta perfectly balancing the natural sweetness of the fritters, so I serve them with lemon or lime wedges and a simple Greek-style salad of tomato, olive, feta, cucumber and red onion. 1. Place the cashew nuts in a food processor and pulse a few times until they have broken down into crumbs but before they turn to powder. Place them with all of the other ingredients apart from the olive oil into a mixing bowl and combine thoroughly. You should end up with a fairly stiff mixture. Place the bowl in the fridge for 30 minutes to allow the mixture to firm up. 2. Fashion the carrot mixture into balls about 60 g in weight. Carefully flatten these balls into disk shapes and place on a flat baking tray. Return to the fridge to chill for 20 minutes or until you are ready to cook them. 3. Heat the olive oil in a frying pan obver a medium heat. 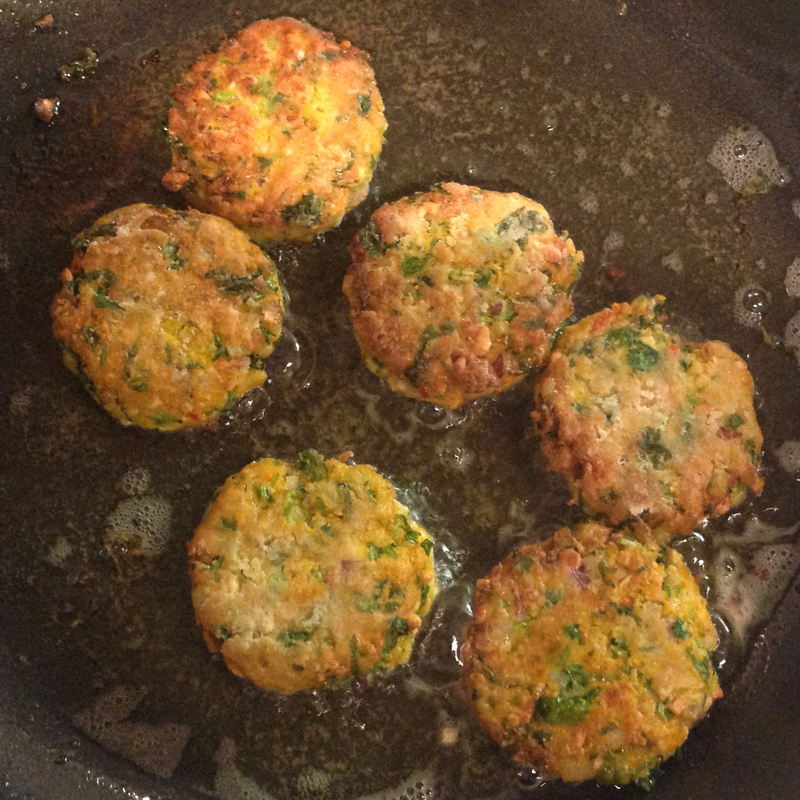 When hot, carefully add the fritters and cook for about 3 minutes per side or until crisp and golden all over. Drain briefly on kitchen paper and serve immediately with lime or lemon wedges. Thanks Angie – please let me know how you get on with the recipe. I wasn’t overly successful when I tried growing Afghan purple carrots a few years back, although the few that did grow at least made an interesting and colourful addition to salads. I’ve also tried the the yellow Jaune Obtuse de Doubs but keep coming back to Chantenay, which have been successful for me year on year and are also very flavourful. With you all the way with F1 hybrids, whether I save seed or not I always by fertile varieties and usually opt for heritage – purely and simply to add my few pence towards keeping these varieties economically viable and thus available. The ration of F1’s v’s non-F1’s now in seed catalogues is quite astonishing if you just take a moment to look. Lovely combination of flavours in your carrot patties too by the way! Great story and a lovely recipe! I will definitely try it out. Also, like the idea of serving it with Greek salad. I may also try with plain yoghurt. Hi Natasha and thank you for your feedback. I think this would certainly work well with a plain Greek-style yoghurt.